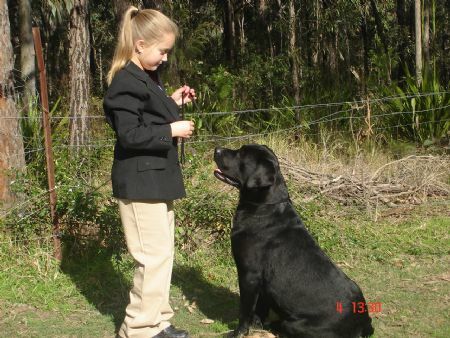 At Degel Labradors, we are dedicated to producing top-quality Dogs with excellent temperaments and soundness that make quality family companions, and with looks to match. Our labradors play a big part of our family. We breed Black, Yellow and Chocolate Labradors. From birth our pups are raised in a loving, family home environment on our property where they are socialized with friends and other family pets. Puppies are vaccinated, Microchiped and dewormed prior to leaving our home at 8 weeks. Our breedings are carefully planned from sound lines that are certified for elbows, hips and eyes. We also test for PRA - Progressive Rod Cone Degeneration. and EIC - Exercise Induced Collapse. NOTE I DO NOT ADVERTISE ON ANY OTHER WEBSITE OTHER THAN DOGZ ON LINE and my Degel Facebook page.